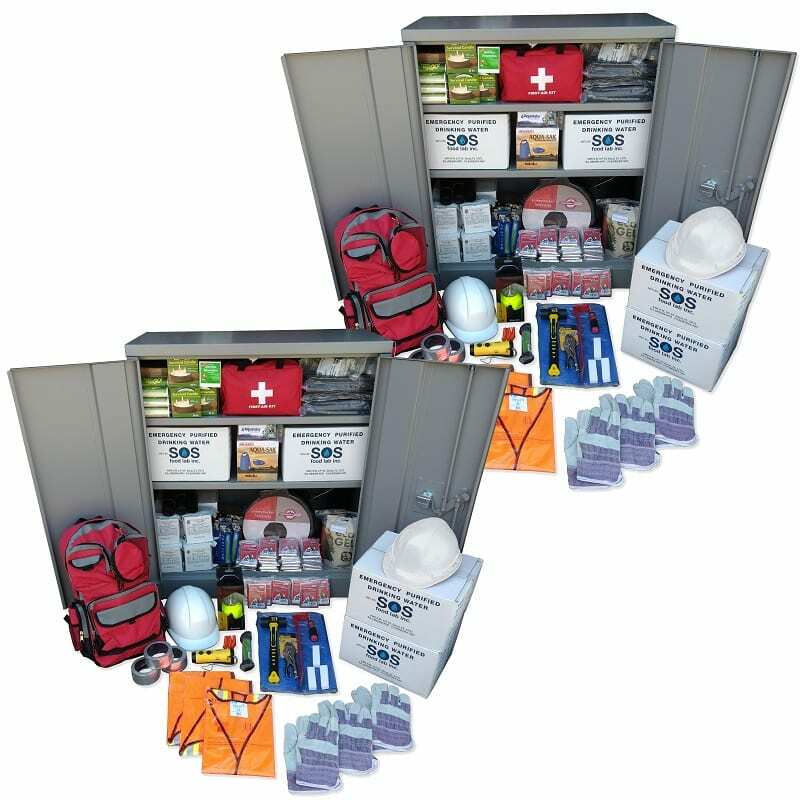 These 40-60 Person 72 hour Emergency Cabinet Kits are elegant and robust, turnkey solutions for organizations looking to get prepared. The cabinets are constructed from heavy duty 14 gauge steel and are squat to minimize tipping and damage in an emergency. These kits include two cabinets for organization, allowing supplies to be distributed at different points throughout the workplace or office easily, avoiding crowding. For assembled or customized kits please speak with our professional team at [email protected] or 1-888-832-1733. *Some locations are exempt from free shipping on this product. If you’d like to ensure that you are eligible, or if you’d like a shipping quote, please contact our team at the above number/email. Please allow 3-4 weeks for shipping. 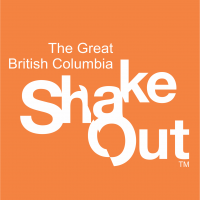 Emergency preparedness is one of the biggest pieces of business continuity planning and can be one of the most daunting. 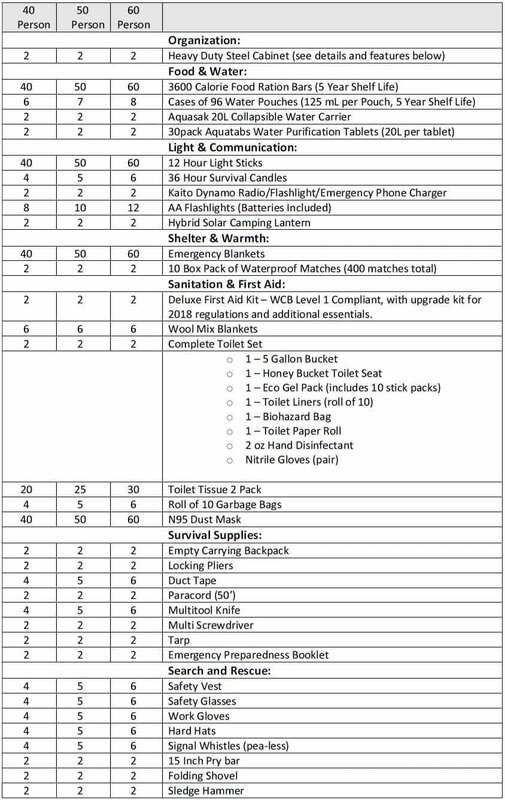 This is why Total Prepare designed our one-stop-shop, turnkey, all-in-one 72 hour Emergency Cabinet Kits. They’re some of the most comprehensive kits in the industry packed into a resilient, heavy-duty steel cabinet. The cabinets come unassembled, clearly labelled “Emergency Supplies” and with a ‘break in case of emergency’ box for the spare key. This allows employees to access the supplies if needed, but dissuades any unauthorized entry during day to day operations. We’ve designed these kits to pack into multiple, stout cabinets for easy distribution throughout a larger workplace. The shorter stature of these cabinets also makes them safer for emergencies that would topple tall cabinet options, potentially causing supply damage or injuries. 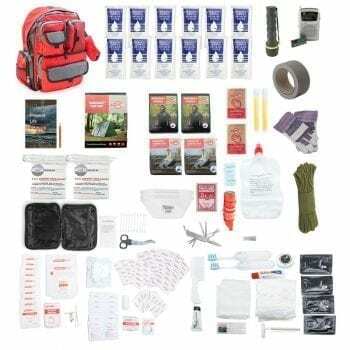 A broad variety of supplies are included in this kit, including food and water with a 5 year shelf life, cell-phone charging flashlights and lanterns, toilet kits, WCB Level 1 First Aid kit (updated to 2018 standards, with additional essentials added as a bonus), and search and rescue tools. 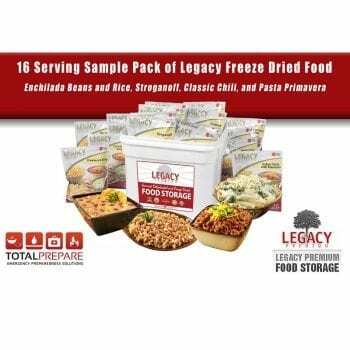 We cover all of your preparedness needs, not just food and water, and for a full 72 hours. These cabinets usually ship unassembled, however if you’d like to discuss assembly or options for customizing your kit please feel free to contact our professional team at 1-888-832-1733 or [email protected]. Comes with heavy-duty padlock, spare key, lock box, and “Emergency Supplies” decal. *For pre-assembled or custom cabinets talk to our team at 1-888-832-1733 or [email protected].